Edit: This all assumes that your installments stay the same from start to end of the loan. 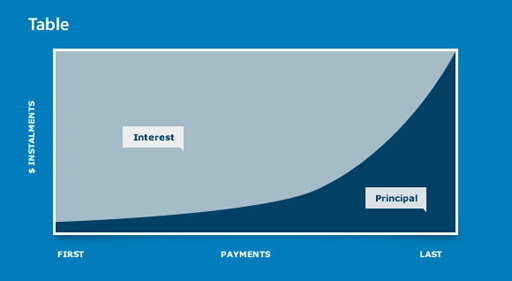 In short, because the loan balance (principal) is at its highest in the beginning, and thus the interest (which is a percentage of the principal) makes up a larger portion of your loan installment (payment), the remainder then goes towards reducing the principal. This means that for the next installment, a (slightly) smaller part will pay the accrued interest, and a (slightly) larger part will go towards payment of principal. This is why a few extra payments towards principal in the beginning - if you can manage them - can save you a lot of interest over the lifetime of a long-term loan. In a nutshell, because a mortgage gets you that far out on the limb. You are just barely able to pay the interest as it is coming, and are only able to reduce the principal very minor. That's obviously the maximum you can borrow sensitively; anything more, and you wouldn't be able to even pay the interest. Of course, if you borrow less, the ratio would be better from the beginning on, but houses are expensive, and people tend to go to the limit. Not the answer you're looking for? Browse other questions tagged mortgage loans repayment or ask your own question. Does there exist a kind of loan where no part of principal is paid, while interest is still paid?